WordPress is undoubtedly one of the most popular and powerful platforms for those who are thinking to start a website. It is not just easy to use by offers huge range of attractive themes to select from. So, if you are looking for a unique, straightforward, and simple websites for your different needs then single web page themes from WordPress are the best options to choose from. Most of our clients often come up with the question related to single page web design. Quite undoubtedly, it is very much popular and we witness a lot of attractive single page WordPress sites that are based on single web page scrolling system. But, there lies another question that how the single web page concept can help in building search engine traffic? Through this article, I would like to share some helpful information that you may find interesting. As the name suggests, you can find each and everything of the landing page of the single web page WordPress themes. The possibility to get a fine transition effect between the sections of the page is one of the best things about one web page design. And, this effect is usually incorporated as a scrolling system taking online visitors to the proper spot on the web page upon pressing a navigation component. This possibility let one web page websites to look unique and stylish as well. This is the reason why they are quite popular for online portfolios. Through this article, we will take you through some of the best and highly popular single web page WordPress themes that you can consider for your website. Since in this type of themes the entire content is just in one page, therefore sliders and scrolling methods have been widely used. So, check out some of the hottest themes and choose the one you like. But, make sure it is compatible or suitable for your needs. This WordPress theme is based on Twitter Bootstrap and offers over 20 unique homepages that can be tailored for any creative or business agency. SmartBox has been designed for mobiles as well and look will certainly look great on all types of display. This is one among the stylish and unique one page WordPress themes with numerous features like unlimited pages, unlimited colors, and unlimited posts, blogs and more. It is a multi-purpose theme which is quite suitable for building portfolio for your company. The functionalities of SimpleKey are quite smooth and offers a clean look. This single page WordPress theme comes with short code powered feature and offers a clean and simple layout. It is a one page portfolio theme. It is easy to manage and set up as there are no complex requirements associated, and has built in options. You will definitely be impressed by the landing page of this premium WordPress theme. Hybrid also offers bookmark able links, a dynamic URL update, Google Analytics, completely useful browser history, etc. Google Analytics offer Custom Events that follows each segment of the landing page one at a time. Hybrid is amazingly fast when it comes to loading. In addition, it also offers superior experience for tablets, mobiles, and Retina devices as well. This WordPress theme can be used for writing blogs. It is not only a simple website, but it also includes customized options such as whistles and bells. You can explore every detail of this website and check out the interesting features. 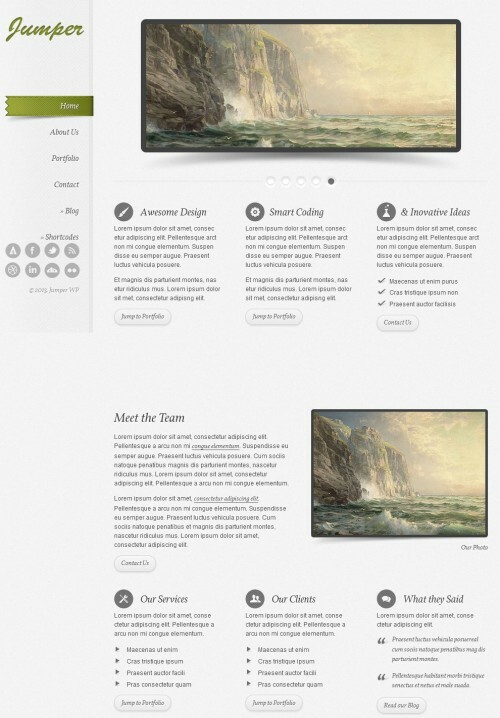 It is a premium WP template that works well for personal as well as professional websites. It can be used for single page websites or long page websites. Further, managing the posts is also easier with this theme. Though CucooTap may look like an ordinary single page site, but it is amazingly compatible with various mobile devices and completely responsive. The Homepage Builder of this theme will let you to point out prime details and aspects of your content in a contemporary way. Moreover, it also offers integrated Portfolio Gallery. 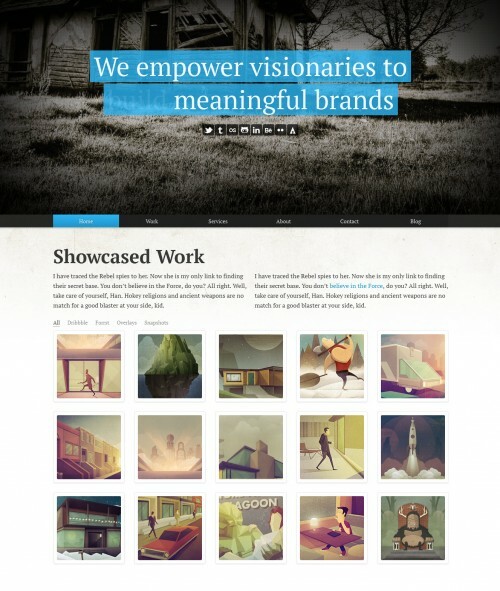 This responsive theme has been created with HTML5 and it offers unique performance when it comes to page-load. It is a new, clean, modern, dynamic and elegant one page template. Creative people find this beneficial as they can make use of unlimited patterns and colors to build a perfect site. In order to have a versatile site, you can use the light and dark styles. You will definitely like the style quotient of this theme and its responsive feature will leave you astonished. No doubt, it is quite an excellent option for portfolios. It is a single page portfolio featuring the usage of WordPress theme. One can gain many benefits with this portfolio as it comprises of many customized features like contact information, showcase images, bio information, portfolio items, headers, twitter set up and a lot more. This theme with Parallax Effect can be defined as sleek, highly responsive, and full of attitude. Ego offers many features like a full screen slider accompanied with custom captions, a blog, contact form, an AJAX portfolio, etc. It is a single page theme with clean and minimal design that is suitable for professional as well as personal use. If your content is powerful, then this is the perfect template designed for you. This is a business portfolio that can be used for any template of one page. Using this template builder, single pages can be created to hold the entire content. This theme can be used as wordpress normal these as well, however coalition will be the same with pages, blogs and posts. 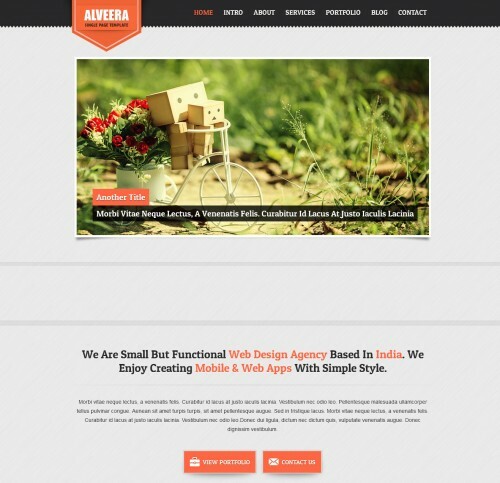 If you have soft corner for retro looking websites then Alveera is the one for you. It is a single page theme that comes with nice combination of colors and pleasing design. You can use this HTML5 based theme for personal as well as professional sites. Compatible with all types of mobile devices, this single page WordPress theme is powered by parallax effects and is highly responsive, which makes it quite useful for promotional purposes. Impress offers a blog page with minimalistic design. It is a single page WP theme that suits well for those who want to display their work. Graphic designers, web designers and photographers find this site very useful. This site has 2 color variations: light and dark; and 2 portfolio options: slider and gallery. Further, there are 9 interesting transition effects too. It I easy to use and also includes customized shot codes to make easy editions. It is also a one page WP them suiting the requirements for portfolio and business websites. You can find 12 variations with this theme. Brave is 100 percent responsive and features beautiful dark theme for WordPress. It offers unique menu, multiple color schemes, comment/contact forms, complete documentation, touch/swipe image gallery, and highly customizable short codes. Designers have equipped WP Singular WordPress theme with a powerful page builder that will allow you to customize your single page website quite easily. In addition, it also offers Google Fonts, which is undoubtedly a great feature to consider. If you want to launch a website instantly, then theme will be beneficial for you. It is useful for creative minds, businesses and individuals to showcase their talent and services with this theme. It is simple and designed with extraordinary features to help talented individuals. This page is composed of numerous WP page by which you can create your single page. It has navigation link as well as content section as customized options. Further, the number of pages depends on you, increase it as many as you can. It is a WordPress theme with responsive template suitable for business, agency and personal purposes. The design is explicit with modern features. It is a single page professional template suitable for different kinds of personal and company websites. If you want to showcase any of your service, product or portfolio in a simple manner, then this single and multi page template shall help you out. Whether you wish to have a single page website or a grand website, Slicer will work out everything. With unique appearance and different style, you can enhance your website. You can even modify every section according to your requirements. This theme suits quite well for sale of products such as e-books, real books, icon sets, learning courses and downloadable products. You can as well feature services of different companies too. The other features include write panels, visual shortcodes, customized posts and a lot more. Encore theme for WordPress can be defined as a completely responsive and sleek one web page site that is filled with attitude. The theme boats a full screen homepage section incorporated with an AJAX newsletter sign up form. In addition, it also encompasses a blog, an AJAX based contact form, and built-in support for MailChimp and Campaign Monitor. If you are looking for a WordPress theme for magazines and is responsive then you can go for Bolid. It offers a flexible homepage and can incorporate large amount of content, which makes it more suitable for bloggers. Modular featured segments, sliders, carousel widgets, and flexible design are the prime features of this theme. In fact, it also offers over 50 advance short codes along with short code generator support. It is a premium WP vCard theme with interesting effects and scrolling design; the theme is also minimalist and sleek that you will definitely like it. The new brochure style layout is brilliant as you can showcase your images too. Home page also has a content slider that suits well for mini portfolio, personal websites and virtual card. This responsive theme has been designed as per Twitter Bootstrap structure and is highly suitable for NGOs, business purposes, and portfolio development. The single web page theme has been created with CSS3 and HTML5 technologies. Impuls supports WordPress 3.5 and higher. This WordPress Theme for single page site is quite a good option for building portfolios and is really helpful in promoting your business or company. It is based on the latest WP version and comes with a complete control of colors and backgrounds. This is Ajax WordPress theme comprising of cool features. It also has amazing features such as menu colors, logo setting, background, icon color and many more. You can improve your website with Ajax posts and interesting parallax background. 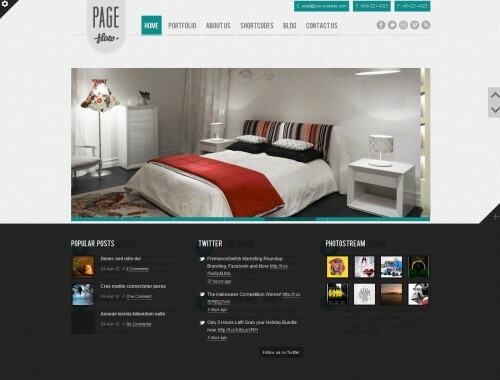 This is a single page premium WP theme suitable for small websites presenting business or other service. The major part of this portfolio is the page, and it has no specific functions for blogs. It is a one page professional template suitable for business and individual purposes. Also, company website can be created in the simplest manner. This theme has been tested with major browsers including Opera, Chrome, Firefox, IE7, IE8 and Safari. It is a very decent looking theme created in a way to fulfill all types of requirements. Modern and properly arranged lines are the main features of this theme. In addition, it also offers other features like AJAXed Portfolio, retina ready, short code manager, and image gallery section. Mercurial is absolutely suitable for companies, event, photographers, product presentation, and freelancers. You can create the website however you prefer by incorporating simple page colors or backgrounds. SCRN can be defined as a simple yet effective WP theme that offers single page design and is perfect for promoting your company or business. In addition, it supports all modern mobile gadgets. The way Nanica can be customized is really amazing. It offers several features like Social Icons Option Page, Drag and drop Sortable Slides, Theme Options, and Nivo Slider Options. It has great features and responsive is one of them. You will definitely like its slick and smooth framework powered with Ajax. 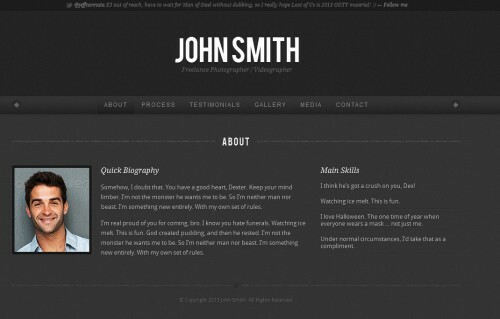 It is a WordPress template for minimalist and professional portfolio. This template has simple CMS to make the one page template easy without reloading of page. This is a minimal and clean grid based theme. It can be used for portfolio website and for other purposes too. You can use this site to set up any of your dream in any way. Reactive is a pretty decent looking single page WordPress theme that offers a nice feel when visiting it. The responsive site comes with single column design which looks quite modern and somewhat professional too. This is a one page WP portfolio with contact section and blog features in it. It is the most popular theme that has been mentioned at CSS awards too. You can showcase your products with this theme using background images, patterns and various colors. HTML5 and CSS3 are the prime elements of this WordPress theme and it incorporates all the basic features you can think of. You can easily customize this neatly designed single page responsive site and give it the desired look. This is a premium single page WordPress theme for those who are looking for simple, yet a stylish website. This WordPress theme offers tons of features and options to select from. Apart from the Parallax feature it offers on the main singe page, it also lets you to use the effect on a page section. You can modify page/parallax sections per pages/blog post. This is another WP theme with 3 skin features; they are light, dark and darklight. It also includes 3 backgrounds, single page news, contact form, filtered portfolio and other features. This theme has been designed of portfolios and offers a grid-based design with stunning looks and superb functionalities. You can build customized galleries and choosing specific groups like posts, portfolio, Flickr, pages, and Instagram. It is a highly capable responsive single web page WordPress theme that offers everything you need to create a wedding related site. However, you can use this theme for other reasons too, as it can be customized quite easily. This WordPress theme is quite suitable for building a neat and impressive portfolio for your company or business. Viewpoint supports all kinds of mobile devices you can find these days. Apart from a stylish single page, this theme also offers a blog. It is a single web page WordPress theme for designing portfolios and is highly responsive. You can use it for promoting your entity or simply as a blog. It is a totally responsive WordPress theme constructed with an advantage of Bootstrap. Desillusion embraces a blog and an Ajax powered portfolio, a full sized tailored Google maps and a newsletter and Contact form. ShapeShifter 2 is a single page WordPress theme and is responsive too, which means that it will easily fit into all types of screens with different sizes. In fact, touch gestures also work smoothly on the slider. It is a single page WP portfolio theme that is specially designed for photographers, designers, video producers, freelancers and illustrators. It is easy to use and an effective method to share the work with fans and clients. The theme first display the name and work to the visitors; then it displays your portfolio with features of pagination and category filtering. Your pictures and videos can be displayed with descriptions. If you are looking for a fresh, clean, and simple interface for your one page website then Super Agency is the one for you. Apart from being highly customizable, this theme also offers 9 attractive skins for different looks. This is one page portfolio with html template known as Me. It has fantastic and special features that are easy to use. There is detailed information along with tutorial videos to help you out. 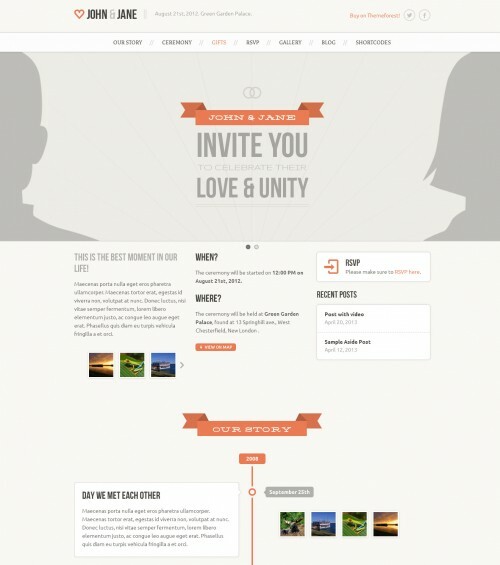 It is a WP single page theme with scrolling feature. Creative people can use this theme to display their work in an innovative way. Photographers and web designers can enhance their talent using this portfolio. Some information about SEO and one page websites: SEO is a major concern when it comes to the looks of the website, or the design of website. SEO needs a discussion has it is worth to consider before selecting any theme. Primarily, Google along with other search engines rank the pages on the basis of understanding the content. Hence, the structure of one page websites has to be kept in mind. Long pages with numerous topics are difficult to understand and take much time creating confusion. All the topics and keywords needs to get matched in order to cover well. The next thing to remember is that the presentation has to be perfect for single page website. It has to be effective with right keywords so that it ranks top at the search engines. You also need to make sure that one page websites should support the sub pages. This will help in content building adding more details like skills, products, company and other important things.